Chuck your old shoes out! Your choice of shoes is paramount and yet, many people fall into the trap of trying to get ‘just one more walk’ out of their old favourites! This can lead to accidents, soles being duck taped together and foot injuries. This is so frequent, that one enterprising guardian sells new boots from his refuge. Reservation of refuges and meals, guided treks, self guided, tailor made itineraries, different levels of comfort, with backpack or lightened sack. Corsica Aventure GR20 specialist. Get comfortable with your equipment ! Make sure your gear is right for you, above all do not weigh yourself down with unnecessary clobber. 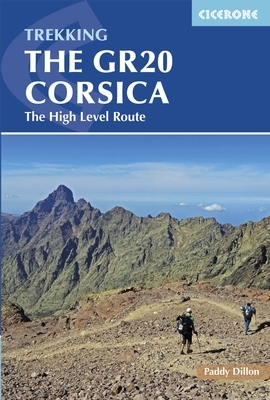 The GR20 Corsica The High Level Route by Paddy Dillon.This guide book is a great source of information, it offers a gradient profile and summary of each stage of the trek, from North to South. The information is accurate and up to date. 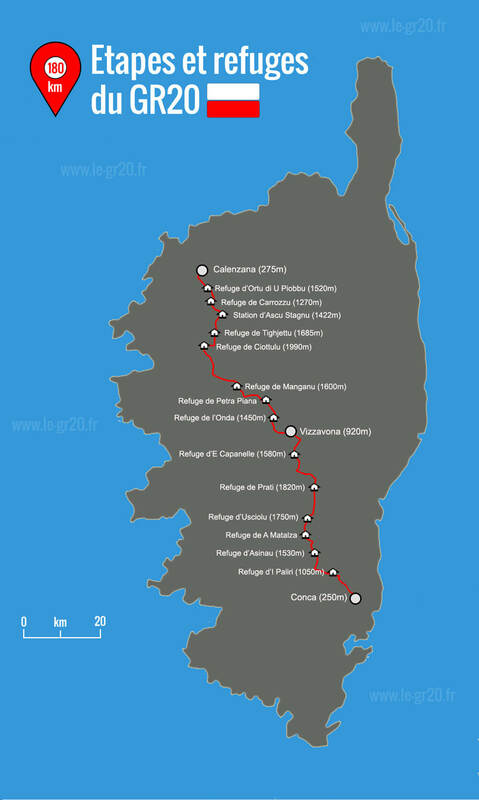 Should I start out at Conca in the South and walk towards the North, or should Calenzana be my starting point? It is possible to do the trek in both directions. The majority of French walkers start in Calenzana, simply because this is how the original topo was written. The villages at the two extremes of the trail are Calenzana and Conca. I would think that a major factor for determining the sense of your trek would be which flights and airports you find the best prices for. The highest most exposed part of the trail is in the North. If you are walking the trail early in the season ie end May to early June, you would be better to start in the South. A week to ten days can make a big difference for passing the cols that will be covered with snow. Walking or Winter Mountaineering ? Southern difficulty - In the South the most exposed part of the trail is between Bocca l'Agnone to Usciolu refuge and then Prati. The ridge is high, exposed and long. You are flirting with an altitude of 2000m, it ondulates and is a bit technical. In good weather conditions, the ridge is an absolute pleasure that offers wonderous scenery. However, in high winds and snow it is a completely different scenario. Northern difficulty - Rather than long ridge walks, the difficulty in the North is high ridges/breches and plunging rocky descents. Since the seemingly permanent closure of the Cirque of Solitude, the highest part of the trail is situated on the Monte Cinto ridge at 2600m between the accommodations of Haut Asco and Tighiettu. If you want to do the entire trek you need to take into account your start date to make sure you are not traversing the ridge when there is snow. List of equipment to bring to do GR20. All the information you need, to find where to eat and drink on the GR20, restaurants, small shops, shepherds with cheese and sausage. In Which Direction. North to South, or South to North. The single most important equipment choice you make before leaving has got to be the choice of shoes. Planes, buses, taxis: transport to join the departure of the GR20. The best maps of the route are produced by the IGN (Institut Géographique National) at a scale of 1:25,000. Is the GR20 for you? The GR20 is certainly one of the hardest long distance walks out there. Several factors contribute to this, the rough rocky terrain, the unpredictable weather and micro climates. The stone base layer, is what exists today of Carrozzu refuge. The above floor is the proposed design for the modernization. The GR20 is protected by the Parc Naturel Régional de Corse. With such a large volume of people every year, there are certain rules in place to protect the area. How about electricity on the GR20?